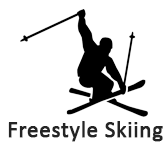 What is Freestyle Skiing ? Freestyle skiing involves lot of guts to attempt the sport. Basically is a mixture of height and speed. Large snow fields are the ground for this game. Players should slide down the ramp called i run and gain pace so that and the end of the hill they should take a fly. During the fly players are supposed to perform cross, moguls, aerials and different forms. We are going to discuss briefly on the game in following sections. We will discuss in detail on this sport and whoever wants to gain knowledge on Freestyle Skiing and wish to play and know its rules, this is best suited for them. People should have passion towards this sport and in learning to play this game. Freestyle Skiing How To Ski?